It’s been a while since Hong Kong has last stepped into the classic wuxia world created by Jin Yong (金庸), and after nearly 20 years of staying away from the lore, it looks like Hong Kong is ready to tackle the world of wuxia again. 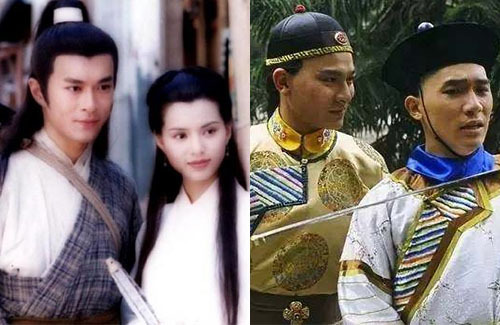 According to official news reports, various Hong Kong directors have already announced their intentions on remaking several Jin Yong classics, including The Return of the Condor Heroes <神鵰俠侶>, The Heaven Sword and Dragon Saber <倚天屠龍記>, and The Duke of Mount Deer <鹿鼎記>. Tsui Hark (徐克), who will be directing The Return of the Condor Heroes, plans to release the film in four parts. Wong Jing (王晶) will be collaborating with TVB to produce a film version of The Heaven Sword and Dragon Saber into film, and sources say he has already cast TVB actress Rebecca Zhu (朱晨麗) to star as Zhou Zhiruo. Pang Ho-cheung (彭浩翔), on the other hand, has expressed his interest in adapting The Duke of Mount Deer. Rebecca is lacking in the acting and looks department to play ZZR. Lol here we go again. But TVB can’t be any worse than the post-2009 Mainland adaptations of the novels…right?? Of the 3 planned HK projects, I most look forward to Pang Ho-cheung’s. He’s one of my favourite directors. Love his quirky movie. It will be interesting to see what he will do to DOMD. Look wise, I think Rebecca is a good pick. She looks soft and gentle, which is a suitable look for ZZR. please stop milking the jing yong novel for ones and and all. but if it is directed by the the great wuxia director tsui hark then i will watch it. rebecca zhu as zzr?? she is not pretty enough in my opinion, there are not many actresses at tvb that suite this role now. zzr must be beautifull, soft but also mean and revengefull at the same time. natalie tong may suite this role i think. I agree to kolo 100%. Mr. Yong’s novels should be in historic archives and no one should allow to make any TV series or movies. Don’t we feel sick and retired of watching them again, again and again. It does not raise any enthusiasm even though some new elements are added or the best director is employed to make them. Just give me a break. Holy cow. China remakes, Hongkong remakes. Producers must be convinced there is a market for remakes. Film industry? They’re trying to pack huge novels into movies? G’luck to them. I don’t see this working well for any of them. @coralie Need a brilliant scriptwriter to condense a long story to a 2-3 hour movie. Totally agree as it is hard to put such long JY novels into movies. A TV series cannot cover it all so how can a movie do it? Even if there are going to be parts, will they be sufficient enough? I doubt it! China is also remake “The Heaven Sword and Dragon Sabre.” LOL!! !